Help prevent the appearance of stretch marks and increase skin’s elasticity with The Tummy Rub Butter. Expertly formulated to nourish growing bumps, our velvety butter is rich in natural Omegas to instantly soothe dry, itchy tummies. Leave skin stronger, renewed and protected from pregnancy stretch marks. I've been using this cream for about 4 weeks or so. Its hard to tell yet if it will reduce stretch marks as I'm only 20 weeks pregnant, but I'm hoping with regular use through out my pregnancy it will!! Its a nice thick cream, smells good too, its nice to give my belly some attention! Reordering the tummy rub butter - we started with another brand but this is easier to use, smells great and works into skin well. Love using it! Two stars become I was very disappointed with how it smells I really didn’t liked it. I bought this based on good reviews. I bought the tummy rub butter aswell as the oil. My mother had quite a few stretch marks so I knew I was probably going to be more prone to them. I was very surprised to see this resulted in 0 stretch marks!!! I used the cream and oil religiously every day about 3 times daily. It soothed and moisturised my itchy skin. I would highly recommend! This product isn't the cheapest but it is totally worth the lifetime of markless skin. Found this stuff on a YouTube video and decided to give it a shot! I’m an African American woman with medium Brown skin and during the transition between 6-8 months wanted to help alleviate any unnecessary stretching by using this cream. It’s really creamy and Though the jar is not huge, I used it twice a day and the jar lasted about a month. It’s worth the money! The shipping took a bit long but it was worth the wait. Heading to reorder now to round out my 8-9months! Tummy Rub Butter saved my skin in my first pregnancy and I am so glad to have it as I embark on my second. I used it morning and night and did not get one stretch mark in the 36 weeks my first pregnancy lasted. It smells lovely, and the ritual of putting it on became a nice little meditation for me and bump as it grew over time. I am now on my third tub of this cream after having it recommended by a friend. It smells gorgeous, it soaks in evenly and quite quickly, it relieves itching really well and it stays on for a long time. I put it on twice a day and have done for most of my pregnancy. With my first child I got an awful amount of stretchmarks (this cream wasn’t available back then!) they were itchy and sore and terrible. This time round I’ve barely had any itching and as soon as I feel a bit of stretching I put a bit more cream on that specific area and it relieves it. I have already recommended this to a number of my pregnant friends. Cannot recommend enough! I have tried many other creams and oils such as Bio Oil and Palmers Cocoa butter etc and they just don’t compare to this cream at all. I was recommended the Tummy Rub Butter from a close friend of mine who swears by it - and it did not disappoint. I'm currently 7 1/2 months pregnant and this has been a life saviour. I have a really itchy tummy, especially in the last 6 weeks and this has really helped to soothe and stop the irritation. Plus the butter is super thick but dries really quickly! Thanks mama mio! I have used the Tummy Rub Butter since about 8 weeks, used as instructed. Spent a fortune on numerous tubs! Pros - Smells amazing Thick but not to thick Soaks nicely into the skin Does not leave skin sticky Cons - Expensive as one tub doesn't last very long Still have stretch marks This cream is great for pregnancy as it leave your skin soft and smelling good, however if your going to get stretch marks they will come anyway, tummy rub or no tummy rub, I will keep using as I love the product, just hasn't prevented stretch marks. 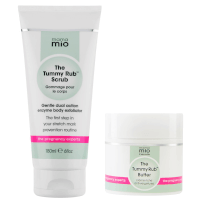 I have heard lots of positive things about the mama mio products and now I'm pregnant again with a second boy I thought a great time to try the mama mio yummy rub! I've been using the product for the last few weeks both morning and night. The cream smells lovely and isn't sticky like other creams I have previously tried. The pot isn't huge so it is likely to go through a few pots of the tummy rub during/after pregnancy, so far i think it's value for money and defiantly helps with soothing and stopping iching in my pregnancy! I have been using this product for the first 7 months of my pregnancy, every day and will continue to do so. It smells amazing and leaves my skin feeling very soft. So far so good! A week into using this cream and so far so good. It a bit thicker than I expected but dries so quickly there's no waiting around to get dressed. Smells Devine and my tummy is super soft. used this during both of my pregnancies, smells gorgeous and i've escaped with no stretch marks. would recommend to everyone and have done to all my friends who are currently pregnant. Bought this for my sister during her first pregnancy and she loved it, plus she didn't get a single stretch mark! Now she's recommending to all of her friends!